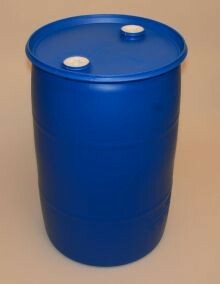 New heavy-duty food grade USDA approved plastic barrels. Each barrel has two large filling openings (bung)-- one threaded with standard NPT threads, and the other with a fine thread bung stopper. All fitted with "O" ring seals. Ideal for drinking water storage. Visit our Drinking Water Storage Accessories Page. The 30 gallon drinking water storage barrels are a closed-head plastic drum has a 2 inch NPS fitting and one 3/4 inch NPS fitting and molded swing handle.closed-head plastic drum is compatible with a wide range of products. The BASCO THO Series drum is made from a high molecular weight, high density polyethylene, a Greif® drum designed with a seamless construction from a one piece mold. The blue color is molded-in, won't dent, rust, fade or peel. This drum has a 2 inch NPS fitting and one 2 inch buttress plug with a 3/4 inch NPT reducer.